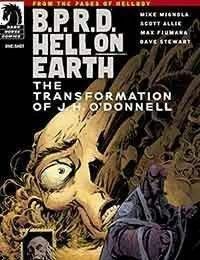 Twenty-four years ago, Hellboy took mild-mannered Professor ODonnell to the secret library of a recently dead necromancer. Since that day, ODonnell has been the Bureaus expert on the powerful ancient forces intent on ending the age of man. Find out what ODonnell saw in this supernatural thrill ride. From the pages of _Hellboy_. _B.P.R.D._ continues to be a solidly crafted horror/adventure serial with many surprises to keep its readers guessing.Broken Frontier **Its all going to Hell in 2012!